Smoking has become life-threatening in the last 2 to 3 decades. Lung Cancer is one of the leading causes of deaths in the United States, India, Europe, and many other countries. People who smoke excessively are the ones who suffer from this disease. Cancer cells begin to grow in our body because of bad habits. Once the physician finds that you are suffering from this deadly disease, he advises you to undergo chemotherapy or surgery. You become thin and your immune system degrades each day. If the condition is left untreated, cells that cause cancer spread to other parts of the body. Doctors cannot treat the later stages of cancer. The patient dies within a few days or weeks. If the patient avoided smoking, he could have lived longer. My intention was to make you aware of what smoking can do to your healthy body. 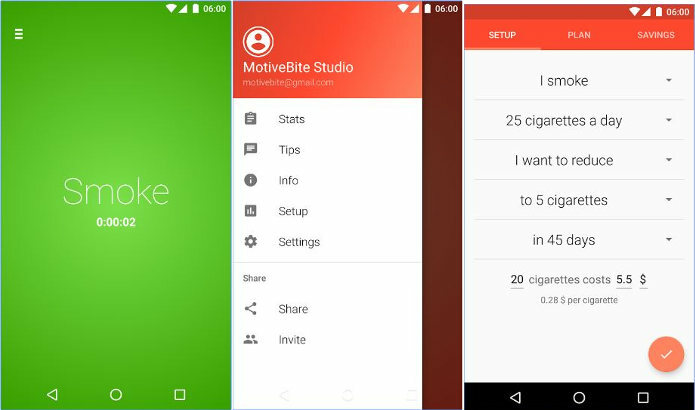 If you’re searching for a technique that will help you to quit smoking, download the apps we’ve shared below. QN is a widely used app. It has helped 1000s of smartphone users quit smoking. The app greets users with a sweet welcome message when they run it. No of cigarettes you smoked every day. The price of the pack and the number of cigarettes it has. No of days passed by as a non-smoker. Total number of Cigarettes you’ve avoided. 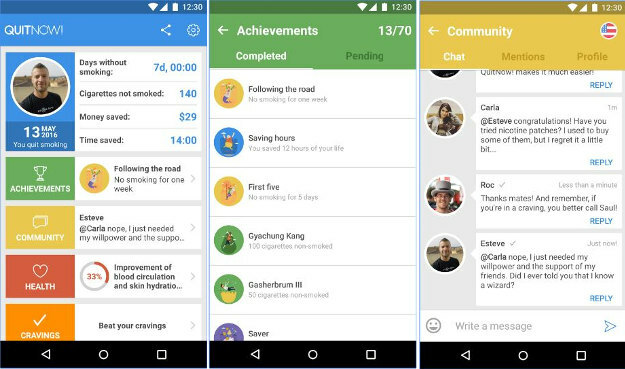 The QuitNow Android iPhone app displays vital information about your health. As we’ve mentioned earlier, smoking degrades your fitness. As you’ve quit smoking, your immune system will return to normal. Over a million people across the world use the QN app. For inspiration, the developers have added a community feature to the app. If you join the community, you can interact with other people who decided to quit smoking. You can also view their statistics. A person can make a decision to stop smoking in a day, but it takes some time to get rid of cigarettes completely. Keeping this thing in mind, developers at MotiveBite published its QSS app on the Google Play Store. Login for saving data online on cloud servers. Begin a new session to quit smoking. Total cigarettes you smoke/used to smoke in a day. What do you want to do? Quit or reduce smoking? The cost of the cigarette pack. Once you enter the details mentioned above, you’ll see two graphs i.e. plan and savings. The 1st graph shows a plan you should follow. The 2nd graph displays money you can save by avoiding cigarettes. Apart from the graphs, the quit smoking app lets you go through useful eye-opening tips and resources which smokers will find useful. With half a million downloads and an excellent rating of 4.6, SK is one of the best quit smoking apps on the Play Store. Its APK size is 29.3 megabytes. The money a person has saved by preventing cigarettes. Their fitness level before and after quitting smoking. SK detects your location and sets currency accordingly. It has a calendar interface to set the quitting date. 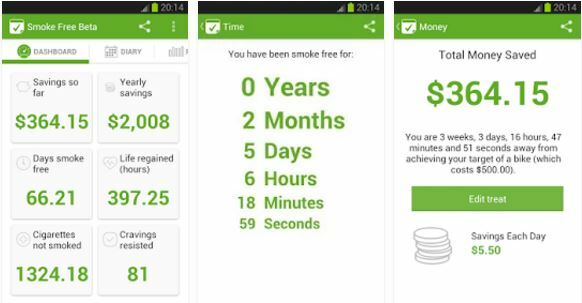 The app shows yearly, daily savings, the amount of time you’ve been smoke (carbon mono oxide, nicotine free). The quit smoking app awards you special badges when you make good progress as a non-smoker. Conclusion: Quitting cigarettes is one of the best decision you have made so far. To help you achieve your goal, download one of the apps mentioned above and use it every day. Within a few months, you’ll make tremendous progress in fitness. Your family will be happy to have you back.